To be awake is to live on a perpetual frontier. Many Red-Tailed Hawks are overwintering in the valley. Driving the backroads in the prairie pothole ecosystem west of the mountains, I often see several per mile—often perching and watching but also often hunting. It’s been below zero this week. I thought most of the Red-tailed Hawks would migrate to somewhere warmer, with less snow. But the density of hawks in the prairie ecosystem west of the mountains, is dense. One can almost always see one or several, perching and hunting alone. I just learned they are monogamous and often mate for life. They share the work of brooding their young each year. The female does most of the incubation and the male brings her food. 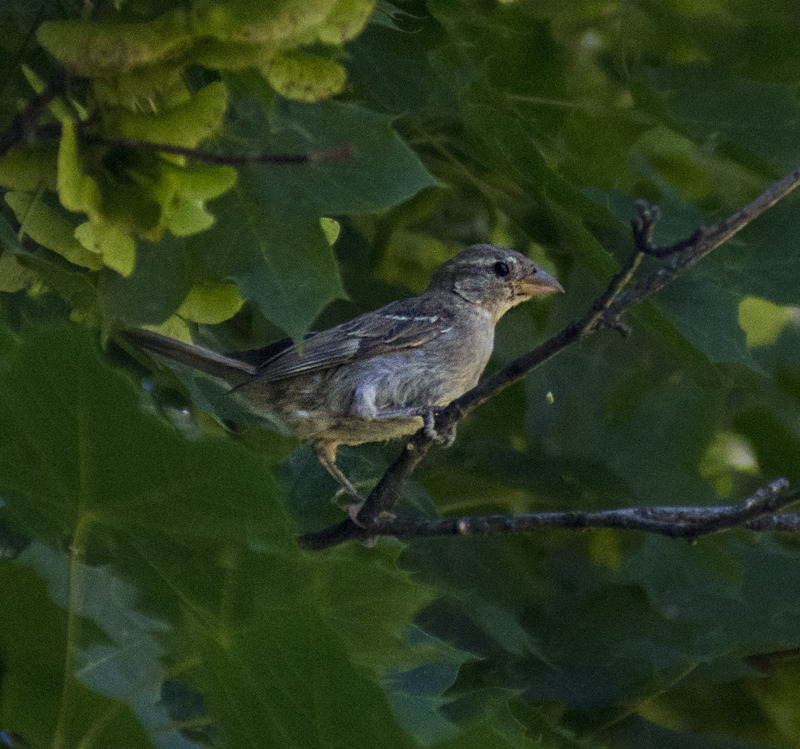 The young fledge at about 45 days, but some of the young remain with their parents as long as six months. These facts don’t fit the image I had formed of them, hunting individually through the summer. In July I saw one perched on a fencepost, holding down the shredded remains of a baby skunk with his talons and ripping off strips of flesh with his bloody beak. His brow was genetically angled to make him look angry, and his beak formed a perpetual frown. He was the very image of ferocity and cruelty. Of course, he was neither a loving spouse nor an evil monster, but a hawk. He cannot see his meal from both his point of view and that of the skunks. Eating is not a moral situation. In a sense, nature has no endings. Things repeat and repeat in patterns large and small. Through all that commotion and continuity, a person may choose a trajectory that speaks of permanent things. I’m paying more attention now than I ever have to bird migrations—the scale of which is staggering—at the same time I’m feeling a deepening discontent with where I am, intellectually and spiritually. I sense unseen movements taking form around me and being answered within me. Because I’m at work during the days, the most vivid parts of my life now seem to be sunsets in a world becoming more autmnal by the day. At work, the officialese about change has become a habit for many people, a way of nodding off or going with whatever flow the guy at the front of the room is peddling. It gives an illusion of having mastered what we have not mastered and do not, I suspect, even see. It feels a bit stultifying. But outside toward evening the geese in small family flocks rehearse flying in formation, from wetland to grainfield and back. Hundreds of geese in groups of 8 or 9 or 20 in constant commotion. Much of the summer they’ve been at nests in families, feeding on shoots, unable to fly due to the molt. Soon they will form up into larger flocks for a thousand mile trip, probably to Utah or Nevada or Arizona. Their great migratory flights almost define the seasons. Watching them gives me an odd feeling of kinship, seeing a group that allows a kind of individuality in which all take care of each. The birds stay in family groups all year, feeding and nesting and migrating together. This year’s babies will return to this place next year with their parents. If one goose goes down along the way due to injury or illness, two others peel off and accompany it, staying with it until it recovers or dies, then rejoining whatever flock is passing. Geese are intelligently social, and they allow others to join their flocks, though the original pair, which mate for life, remain in charge and the current year’s youngsters remain their priority. They maintain hierarchies, one of which is visible in their flight formation. It’s not a rigid hierarchy and leading is more a burden than an indicator of superiority. The lead goose changes fairly often. 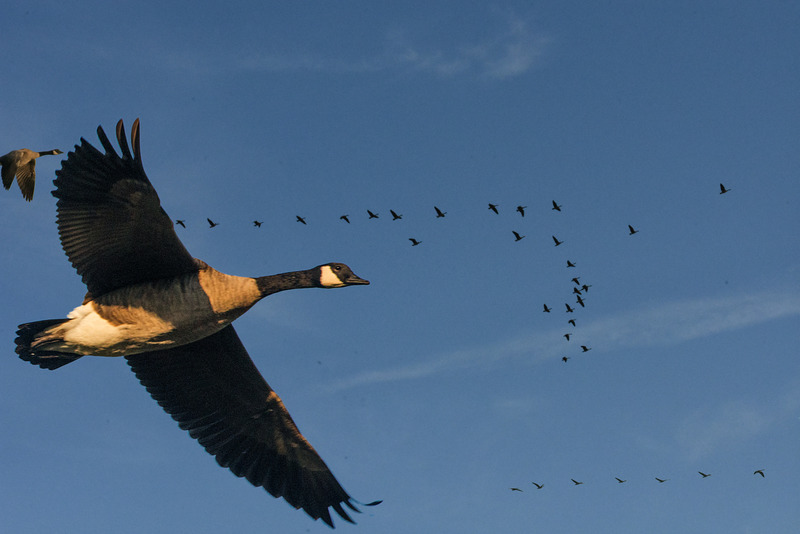 When the leader gets tired, it drops back and another goose, male or female, takes the lead. The unity is gorgeous and it keeps them safe. Right now all this year’s youngsters are in full flight, and they are everywhere, highly visible out on open water and in the sky. Some birds have already left. I don’t see the osprey anymore. The blackbirds—both yellow-headed and red-winged—are still here but with the nesting over they are no longer territorial. They move about in flocks numbering in the thousands. What I’m appreciating this year about migrations is the deep focus on moving on. A tern will fly right past a savory mess of fish offered up for free (though gulls, which are going nowhere, erupt in a noisy contest for a morsel). The birds suddenly ignore the normal temptations and distractions because they are filled with a larger purpose. The great human migrations have often been like that. In America, the great migrations of black people from the south to the north and people from all over the world, including those of my tribe, into the West display a similar focus on a vaguely grasped promise of something that must lie ahead. At work, when I escape the change agents, I’ve been reading in preparation for a Holocaust unit I teach to sixteen-year-olds. I’m approaching it by analyzing the two cultures that were in conflict: the Jews and the modern social Darwinists. One feature of the Jews that caught my attention was that they are the first nation ever that came into being while on a journey. Abraham was going toward something and, later, so were the followers of Moses. What they left mattered less than what they looked toward. Their nation did not develop slowly over ages in a fixed place like the English or the French. They were formed around some words and a covenant that bound them to each other and to a shared purpose, and they inhabited change like their truest home. For people of the Book, the real migration was a spiritual journey, from one state of being to something harder to understand and more liberating to live. We now live at a time when many people are finding kindred experiences. Things once vital wither. The green turns gold. Things fall apart. And yet there is something ahead, something worth preparing for, something worth heading toward. 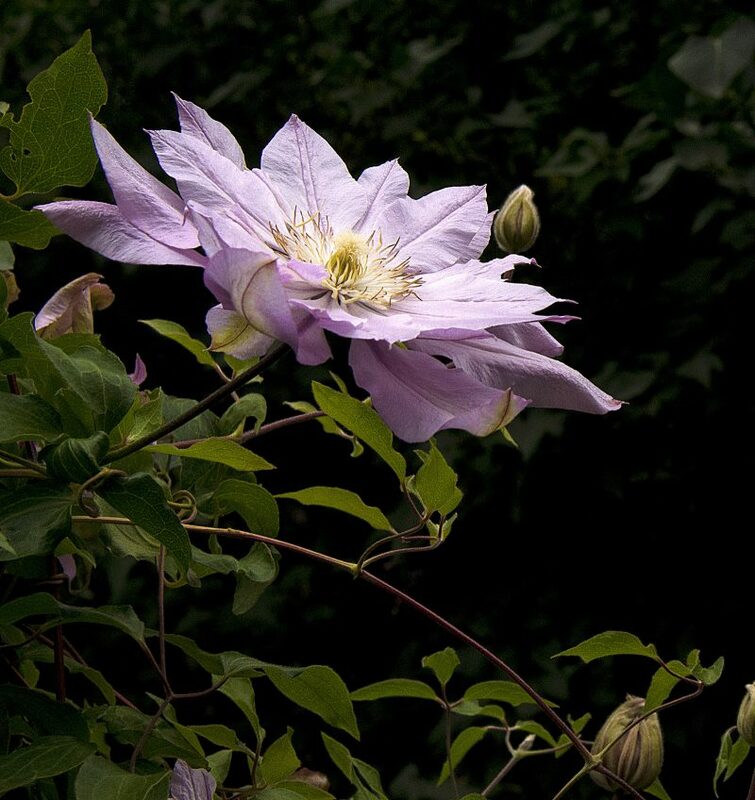 The clematis may be a symbol of ingenuity or of mental beauty. The meanings of flowers, as of other things, can be easily missed by a lab scientist peering through a microscope. There are spiritual dangers in not having a garden because a gardenless life easily becomes a barren life, an unsatisfying simulacrum. What I learn in the garden is mainly the wisdom of traditions that I once kept through faith. I’ve learned from my culture and picked up from books insights that I could see were true in an intellectual way, and through gardening these insights have gained clarity. They’ve been embodied in the substance of my experience. In other words, my culture may be the source of what I know more than my garden. I’ve been fortunate to have been raised in an intelligent culture, amid folklore and scripture more intelligent than I. There are truths in our heritage, if we are lucky, that we can learn only by obedience. Someone decades on in a good garden or a good marriage knows things that words cannot communicate to those who don’t know them. Spiritual truths can be discerned only with the spirit, to which the intellect may be a dull-witted and flat-footed bystander. “Why?” remains the more potent question if one is driven by a hunger for reality. Why-not-ism easily becomes a rationale for thoughtless destruction, as history shows. Why not collectivize the farms to enforce equality? Why not replace fathers with welfare and mothers with daycare? Why not remove the levees that culture put in place to restrain sexual passions? Why not seize money from entrepreneurs and give it to the indigent and improvident? Why not slaughter the cattle of the prosperous to provide a brief feast for the poor? Why not dissolve nations via international financial creatures and open border fiats? Why not plant palm trees in Butte, Montana? Such visions are thin stuff—fantasies without living substance. They are void of wisdom, which is a reality-based phenomenon. An ancient proverb states that “without vision the people perish,” and this is followed immediately with an injunction to keep the law. Moral law structures our cosmos much as the system of forces described by Newton structures the universe. Strong vision is seeing deeply and accurately the laws of human meaning and action. With an informed imagination and intelligent desire we can construct models of actuality in our minds. A weak imagination may conjure up the fantasy of palms and gardenias for a backyard in Montana, but such fantasies can’t be brought into actual existence. They cannot be given substance even with the most committed effort. Stronger visions emerge when we see so clearly why and how things are that we can connect the present with the past, seeing what is becoming and thus glimpsing the future. Imagination is an innate power of our nature to see and understand what we are and what surrounds us. We can build mental models of things as they really are, using them as maps to negotiate workable paths through an actual world. We become partners with Creation, participating in the unfolding of life. The Creator said of Creation that It was good, and creatures in his image can echo that truth. The more we learn about specific plants as well as soil, water, sun, pests and disease the saner our visions can be. We develop our sense of time, understanding and affirming that the creation of a rose is only possible as a process in time. We learn that time is opportunity. I have arching beauty bushes that stand 10 feet tall on each side of the entrance into my prayer garden. I saw them before I planted them, though I see them more clearly now, fifteen years later. There are moments in May when they are so bejeweled with new blossoms that the world is more beautiful than I could ever deserve. Hard work can make life more and more a succession of such moments. With vision we can convert meaningless events into a sequence of shining moments, plot points in the story we author. And we know that for us creation is never ex nihilio. Interestingly, that hoary doctrine of creation “out of nothing” was itself created out of nothing by philosophers arguing from the Stoic and Gnostic world views in the second century AD. It’s possible to create philosophical concepts out of nothing and then to talk about them as though they exist—much of our political discourse in this age of propaganda is that sort of nonsense. But such vanities are not useful to gardeners. For us, creation is a matter of organizing the materials and patterns we find and editing what is present. There’s an admirable humility and wisdom in that. We do not create the rains and the sun and the soil nor can we instill the plant’s nature to grow. We are immersed in grace. And it’s all transient. There are no enduring accomplishments. We can shape and assist but we cannot control. We can only care; gardens are emblems of care. And we have to do the scut work. If we neglect things, they will not thrive. They might die. Azaleas don’t like their roots to get dry. Rhododendrons suffer from desiccating winter winds. Tulip and lily heads are delicacies to deer. Our relationships to the growing things in our garden are the same as other relationships: they require attention and effort. We live best when we find and practice an endless attention and an endless care. Sometimes it’s simple. Where calendula or echinacea or daisies have reseeded prolifically, we remove more than we leave so that the remaining plants may thrive. Some plants need to die to create healthy space or circumstances for others. Sometimes it’s simple. We pull out some bindweed, or we dig out the dandelions. Sometimes it’s harder—removing the maple that has grown too tall, shading plants that need sun. And even with all our care, loss is built into the game. A stand of Austrian pines succumbs to a beetle infestation. A city water line repair removes a stand of lilacs. A drought forces us to let fast-growing plants die so we can provide scarce water to the trees. We meet these things without anger, as we meet sunset or autumn. Loss is built into the game. We are transient beings, made of transient beings, living amid transient beings. The structure of human reality requires sacrifice—those moments when to save something of value we have to give up something of value. It is through sacrifice that we gradually clarify our vision, learning what we truly do love, and learning to order our loves so we do not trade things of little value for things of infinite worth, the enduring things. Sacrifice means “to make sacred.” The sacred, all around us, endures. It is never transient though our grasp of it may be. As we work we glimpse it now and then as beauty. It appears as brilliant moments which we labored for but did not earn as bursting light and joy touch us in our depth, transforming us to luminous creatures of hope, knowing that it is good. Going-to-the Sun: a visit to the high country is sometimes a visit to the past and sometimes a glimpse of eternity. I grew up in a place where one could walk three miles east and leave the world we have built and re-enter the world that has always been. I still live there. Since history is directional and our minds are steeped in history, moving into undeveloped nature is like moving into the past, into the world as it used to be. A little bit of the world I usually inhabit is developed, somewhat. Town consists of small collection of buildings and fewer than a thousand people. There’s probably a three-story building somewhere in town, but at the moment I can’t think of one. Walk a mile in any direction and you will have left the town behind. Probably more people live in the country now than in town proper. So the countryside outside town has lots of houses—on most roads you can rarely travel more than a quarter mile without passing one. There are more newer houses, mostly fancier than those in town, than older ones. Everyone wants to live in the country, at their own Walden Pond, though with satellite connections to the Internet and television—to those media dense with signs that refer to themselves, where meaning and value have been lost. The fact that in less than hour’s walk I can leave all that re-establishes its somewhat ephemeral quality. Very quickly, I can be in a place that seems untouched by history, though in many places stumps and old skid trails are subtle traces of logging. 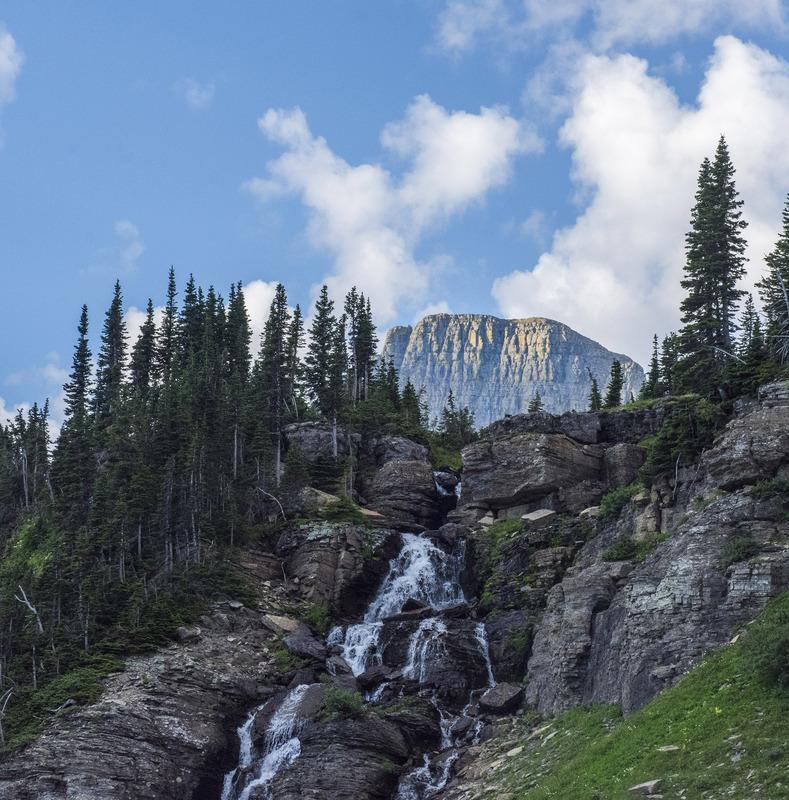 Visiting the high country is a form of time travel. The walk often leads through dense cedar groves along the creek, where at ground level all is in deep shade and nothing grows, up through opens stands of Ponderosa Pine and a thick understory, home to nuthatches and catbirds and waxwings. The mountains is forested in a rich mosaic of conifers, including varieties of pine, fir, larch and spruce. At higher elevations, the vegetation thins. Awakening at a lake above tree line in the crisp thin air (treeline varies depending on exposure to wind or sun, but in Montana it tends to be around 9,000 feet), you are in a climate that moves from winter through a brief spring then back into winter. At the end of July small streams from melting glaciers water the spring wildflowers and grass. The alpine world is very young, with plants struggling to establish and maintain themselves. In such moments, one sees again the first day of Creation. This female Black-headed Grosbeak was staying deep in the foliage of a maple tree, watching but calling no attention to herself. I was paying attention to the discreet birds today, the ones that you have to sit still and watch closely to see: the nuthatches, pine siskins, warblers, catbirds. 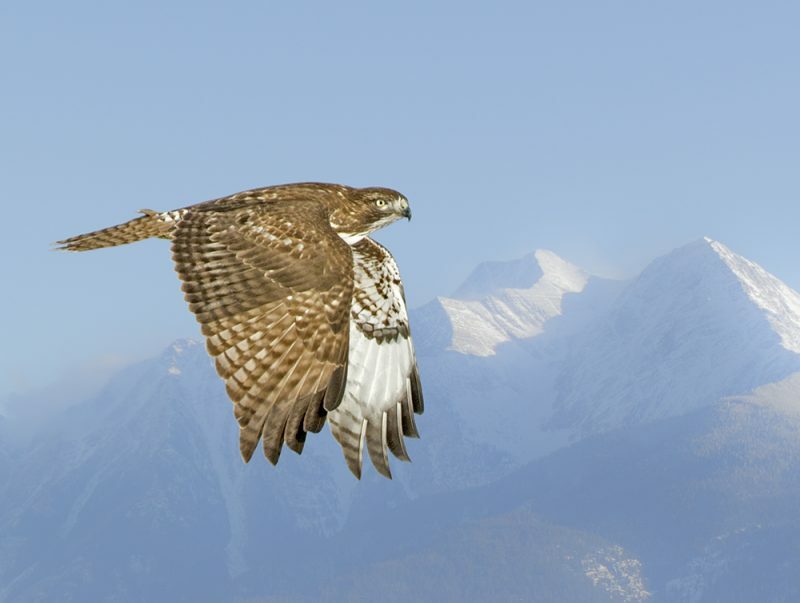 The raptors at the top of the food chain, Red-tailed Hawks or Bald Eagles, like to perch high and visible so they can see the terrain around them. But many birds understand that though they may be predators they are also prey. Today, their caution and discretion seems admirable. We live in an expressive society, based more on therapeutic myths than any established wisdom from philosophy or religion, full of people driven by the strange hope that baring their souls to strangers will lead to connection and healing that they sense they need. It can be costly, needing to be noticed and admired, wanting the be the prettiest bird on the highest branch whose song is heard everywhere. Other birds at any particular moment are more intent on seeing than on being seen. It takes patience and effort to see them at all. Catching a glimpse of a Marsh Wren or a Yellow Warbler always reminds me of how much of reality we normally don’t see. The Divine characteristically hides itself, and some revelation is available only to those whose desire leads them to effort and endurance. The highest knowledge, Socrates suggested, is always a gift from the divine, a tanager that appears suddenly on a blue spruce bough after hours of looking. It should not be profaned by disclosure to the unworthy. Besides, they can’t receive it. It is foolishness to them. It’s not really a secret. It’s sacred.